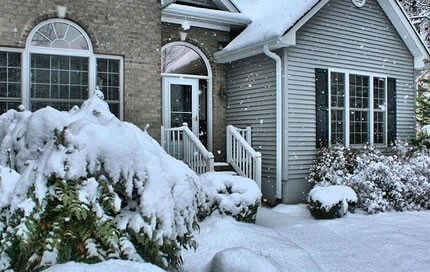 When the weather outside is frightful so are the energy costs for many homeowners. Investing in a few minor renovations in the home can become a wise choice over the long-term ownership of the home. Here are a few home renovations that are the most efficient. Homes loose most of their heat through the roof. Adding extra insulation increases the r-value in the home and lowers energy costs. Most attic insulation renovations should include any air sealing necessary around floor joists and ductwork to ensure a lower utility bill. Older windows and doors can account for over 15% of heat loss in the home. Consider investing in new double pane or argon glass windows that are Energy Star rated for maximum efficiency. Insulated fiberglass entry doors offer superior durability and an insulating factor. Homes with a large number of windows can make up for the cost of replacement in just a few years (Source: Canadian Comfort). A simple home renovation for the winter of replacing the thermostat can reduce energy costs. A programmable thermostat can scale back the temperature in the evening or during the day when you’re out to reduce heating time. You can also look at thermostats that can change the temperatures in each room or your house and thus reducing your energy consumption in your home. A high-efficiency gas furnace requires less fuel to operate and operates at a steady air speed for maximum comfort. Most zoned furnace systems have the added benefit of only heating the most frequently used areas of the home. Supplemental heating sources such as baseboard heaters can tap into cold air near windows and turn into an efficient form of heat without radically raising the electric bill. A considerable amount of heat loss occurs from air that condenses on hot water pipes. Flexible foam insulation and floor batting in basements and crawl spaces can reduce the number of times the hot water needs to reheat. It also protects the home from a potential flooding disaster. On-demand tankless and heat pump water heaters are among the most efficient heaters available. Installing these as a supplement or as a main heater reduce the need for a holding tank to reheat water throughout the day. You can also look for Energy Star compliant gas heaters that are rated more efficient than electric models. Leaky air ducts and points of draft entry in the home can account for up to 30 percent of the heating cost of the home in the winter. Electric outlets that face exterior walls and window casing can be sealed with solid foam products. Consider testing the airflow of ductwork as well to check for leaks. Updating home fixtures and creating a positive weather seal is a step in the right direction for an energy efficient home in the winter. Most air leaks and drafts can be remedied or replaced with an efficient resource by using the following tips.